Saba is one of the islands incorporated in the Netherlands after dissolution of the Netherlands Antilles. Here people annually celebrate Saba Day on the first Friday in December and this holiday is also known as Flag Day. Celebration of Saba Day is connected with adoption of the new flag of Saba. 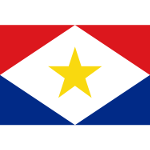 Back in 1985 a special committee was created to chose a new national flag of Saba. The committee had to chose from 130 different versions and they liked the variant provided by an 18-year-old Edmond Johnson. The design of the flag was adopted on December 6, 1985. However the islanders celebrate their Flag Day on the first Friday in December, thus they have a long weekend. The main colors of the flag are white, red and blue. They remind about the historical bonds with the Netherlands. They also have their own meaning: blue symbolizes the Caribbean Sea, red stands for courage and white is for peace. A five pointed star is situated in the center of the flag, and it symbolizes the island itself. The golden (or yellow) color of the star symbolizes the beauty and riches of the island and emphasizes, how much the islanders love Saba.